The description of the Connecticut Historical Society wool quilted petticoat (Accession Number 1959.54.2) describes that it is, "interlined with undyed wool wadding and backed by an undyed, plain-woven wool, possibly homespun." This must have been helpful to keep warm, but it had to be drafty. 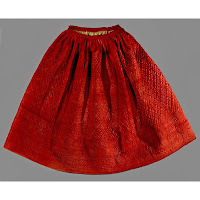 Dale Taylor, author of The Writer's Guide to Everyday Life in Colonial America: From 1607-1783, writes, "Worn-out clothes were cut up for patches, used to make CHAR-CLOTH for lighting fires or, if linen or cotton, sold to papermakers" (p107). That helps answer questions about starting a fire. In the book, Daily Life in 18th Century England, regarding houses for the poor, Kirstin Olsen writes, "Cottages were heated with scavenged sticks, and beds were warmed, if at all, with hot bricks wrapped in flannel" (p93). In upper class homes, "Shortly before bedtime, a servant would light a fire in the fireplace and place a warming pan--a lidded pan filled with coals--in the bed itself" (Olsen, p89). I could use that tonight. 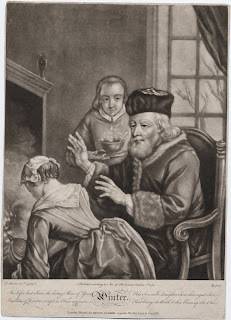 The description for this print reads, "An old man in a fur hat and a fur-trimmed coat sits in front of a fireplace. In the foreground, his daughter kneels in front of fire using bellows to keep it going. In the background, his young son offers his father a bowl of steeming broth." I don't have a fireplace...but I did get a Snuggie for Christmas.